Penalty Kicks provide a scoring chance with a very high rate of success. Of course, it is possible that the keeper will guess the right way and save your shot, but the chance that you will beat the keeper is much higher. The FIFA 11 version of the series featured an entirely new penalty kick system in which aiming is more precise and less computer-assisted. This system is continued in FIFA 14. This tutorial will go more in depth on aiming and other techniques below. If you use the Supreme FIFA 14 Guide, you shouldn't have to rely on penalties to score goals! When your player is lined up to take the penalty, you will notice the Accuracy Bar, with the indicator moving back and forth in the bottom left corner of your screen. Your goal is to press the shoot button just as the indicator reaches the very center of the bar in the greenest part. Although after this you control accuracy in an even further way, this also has a big effect on the accuracy of your shot. Also note that you can still miss the target even if you hit the exact center of the Accuracy Bar, it all dependends on the aiming that comes next. However, the closer your indicator is to the center of the bar, the more your shot will be helped. After you have placed he indicator on the Accuracy Bar, hold down the shoot button to determine power as you would for any other type of shot. This is where it gets tricky. As you let go of the shoot button, imagine a little crosshair aiming just at the center of the keepers chest. You can move this crosshair with the left analog stick. Aim to the side and a little up or down in order to hit the corners. I typically aim for the bottom corners as they are much easier to hit than the top corners and they still have what I would say is about an 80% success rate. To perform the stutter step penalty in which you stop your run-up to the ball halfway through to startle the keeper, press the shoot button for a second time as you are running up to the ball at the point you would like your penalty taker to stop at. Although this is quite effective in real life, keepers don't seem to be too phased by it in FIFA. To execute a placed penalty, hold down RB on Xbox as you press the shoot button, and R1 for Playstation. The placed penalty supposedly has more accuracy than the regular driven one, and thus less a chance of missing the target. Other than this, follow the same principles as given for the regular penalty. There really isn't much use for the chipped penalty other than to be a bit cheeky. Only try to do this if you are quite sure that your opponent will make the keeper dive one way, as you will look stupid if you try it and it chips up right into the hands of the keeper. To execute a chipped penalty, hold down LB as you press the shoot button on Xbox, and L1 for Playstation. 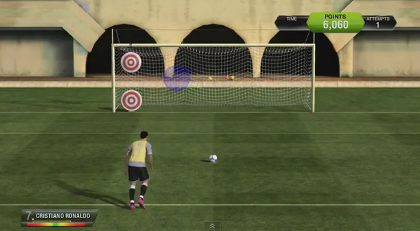 FIFA 14 offers a variety of practice methods to help you perfect your penalty-taking skills. The 1v1 practice arena offers the most direct method as you can simply enter the penalty area and press left on the D-pad to initialize a practice penalty. The Practice Mode allows you to do a lot of penalties one after the other against a keeper. Finally, the Penalties Skill Games allow you to practice your penalties in a variety of ways and actually see how your "scope" moves as you aim. For reference, the picture above shows this scope, the moving blue circle.